Acrylic, Cotton, and Wool, Oh My! So when I first started crocheting, I didn’t realize that there was a whole fiber world out there. I clung to my acrylic, thinking it was the only type of yarn to use. I have just recently emerged as a well-informed yarner and I find myself drawn towards fibers. I will always use acrylic, no matter how much people lament against it, because it was the choice yarn of my grandma, so there is a certain history/attachment/obsession for this kind of yarn. Also, I am one of those people that finds nothing wrong with using acrylic. Yarn is yarn, and as long as there is yarn to be used, I will use it. I will say, though, I am not a novelty-yarn person; I don’t like using eyelash, fun fur, or other yarns of the like. But I like Red Heart, Caron, Lion Brand, etc. and will cling to my “comfort” yarn. Okay, so back to what I was saying. I bought my first couple of skeins of cotton and found that I don’t like it as well. Due to a condition that makes my hands perspire excessively (don’t ask), cotton is a hard fiber to use because it doesn’t have the same elasticity of other yarns and tends to ball-up in my hands. Definitely not a good choice during the summer. I used cotton for a project that I can’t reveal at the moment, but I will have pictures in mid-June. So here is a pic of my new love, in it’s unaltered form (I haven’t been able to start my unicorn yet). The picture cannot possibly capture the softness of the wool, the wonderful texture and feel. When I first brought it home, all I could do was stroke the yarn. 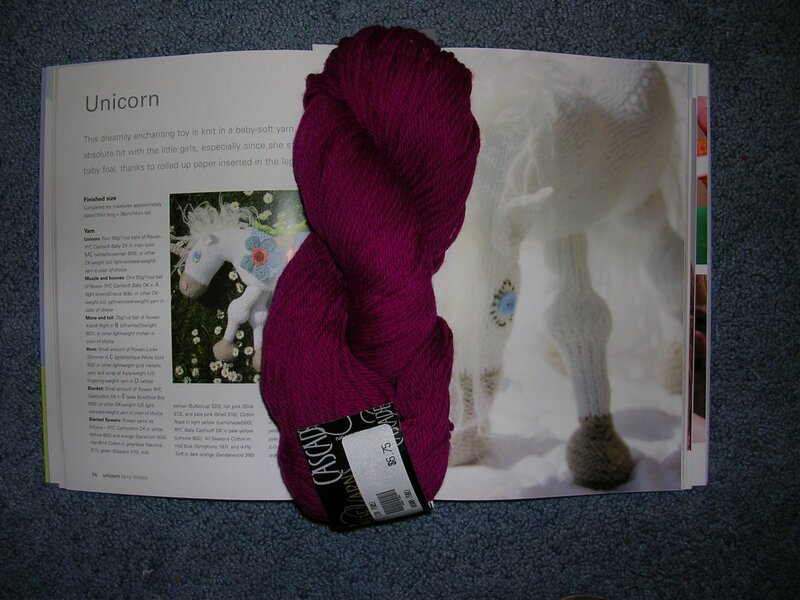 Yes, call me crazy, I am a self-proclaimed yarn-addict! I was so proud of myself for buying wool. Since I haven’t worked with it yet, I can’t say for sure that I am a wool-lover, but I have a good feeling that I like wool a lot. I mean a lot, A LOT. A realization that may be bad for a college-student’s budget.